We are able to pass on savings to our customers with our lower overhead. Equipment used at Custom Gear is reliable and in excellent condition. Our Swiss precision Mikron 79 hobbing machines can hold AGMA 10 quality all day long. Kitai Hoblon 8-FH gear hob machine is second to none in quality and performance. Our Fellows 3" fine pitch gear shapers along with our Fellows 7-2 shaper operate like new and can hold AGMA 12 or better quality. 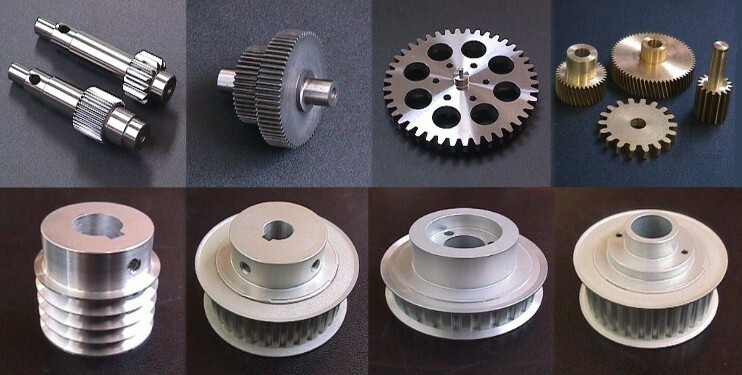 Sample Product Photos shows gears manufactured at Custom Gear Solutions. Many customers will see a gear on our sample gear page that is similar to their needs. Sometimes looking at the photos will help in determining if we can meet your specific needs. Many gears are made from aircraft quality Aluminum, the most common material used is 2024, 6061, and 7075. Aluminum gears can be plated with clear or black anodize finish for corrosion resistance. Steel Gears made from Aircraft Alloys and Carbon steel commonly used are 1018, 1045, 1117, 1144, 12L14, 1215, 4130,41L40, 4140, 4330, 4620, 6150, 8620, 9310. We can provide Black Oxide, Dicronite Dry Lube, Heat Treat and Nitride for steel gears. Stainless Steel Gears, 15-5PH, 17-4 PH, 302, 303, 304, 310, 316, 316L, 410, 416, 420, 430, 440, 440C, passivate available. Other materials used include 360 half hard brass, bronze, plastic, delrin, Teflon.